After many years of waiting and many more years of delays, Kingdom Hearts 3 is finally out. Considered an end to the main story arc of the series called the “Dark Seeker Saga,” everything that has occurred through 17 years of games (all of the games released between that time are canonical to the story) will be brought to a close with this game. However, this won’t be the last of Kingdom Hearts, as Tetsuyu Nomura (the main director of Kingdom Hearts ever since the first game) has stated that there will be more from this series, and he knows that people will want more. Before the review starts however, a bit of a preface: There are many people who really love this series. I happen to be one of them. While I have not been a fan for the full length of the 17 years, I got into the series around 2016, and have made an attempt to play every game within the series, with the only one I haven’t played being Kingdom Hearts 358/2 Days. So all of that was just meant to say this: I am a fan of this series. I am well versed in its lore and I even play the mobile game. I tried my best to play every game that I could get. 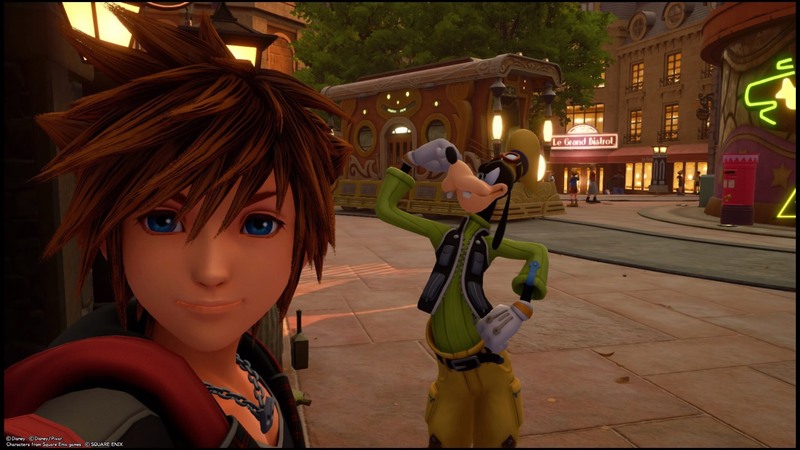 So with that little disclaimer over, its time to review Kingdom Hearts 3. Overall, the game is gorgeous. The new engine works beautifully and runs smoothly without many frame rate drops (unless many things occur at once, which is understandable) and the new character designs are great to look at. There are so many dynamic scenes that occur within this game that are all running on the actual game engine and not in cut scenes, so when the game allows you to play it feels seamless. This game also has the most options out of any Kingdom Hearts ever, as it combines almost every ability from previous titles. With all of these choices, the game can feel very easy at times, with the only time I struggled being the end of the game. (I played the game on Proud difficulty, the hardest difficulty available at the time of this review) where the difficulty rises significantly. Other than that, the game can be completed with relative ease. The endgame content is a bit lacking, but there will most likely be more updates to add more challenge for those seeking it. The story, while feeling a bit rushed at times, wraps together nicely. It pulls pieces of lore from every game into one, so not knowing even a bit of the story can be a detriment to the experience. However, the twist ending and secret movie are marvelous and had me second guessing everything I knew about the series. To cut it short: it was great. There are tons of fan service-y moments throughout, and it really felt like a decent close to the main arc of the series. The typical story structure still stands: Travel to Disney inspired worlds, and help the characters within that world with their problem. During the world and after, pieces of story will be given out eventually leading to a final world where the game will end. The end of the game is amazing in this, with many dream matchups that fans have been waiting for. Overall, if there is anything that is great in particular, it’s the story.